Last night we got to go to the opening of an art show. But it wasn't just any art show. 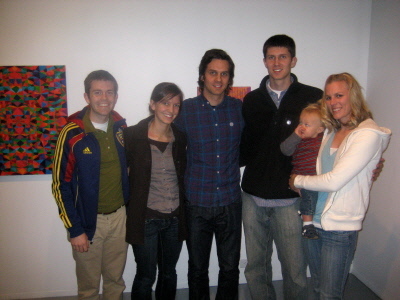 It was Reed's oldest brother, Todd's art show, Evens. It was really cool. We had a lot of fun at the show and seeing Todd. He's really good at what he does and we love being able to learn more about it. Judging by Evan's less than good behavior, he hasn't discovered his love for the arts yet. Thank goodness for Halloween candy and grapes! If you're in Utah, his show goes through December 3. Here's the link if you're interested. If you want to see some of Todd's work, here's the link to his website.